Ricki’s Cookie Corner bakes and ships next business day, Monday through Thursday unless a later arrive by date is specified at checkout. Our standard shipping arrives in 1- 3 business days. Certain limitations may be implemented to make sure your recipients always receive the freshest goods possible. Call us with any questions you may have. Because we bake cookies the morning of shipment we cannot accept same-day orders after 12:00pm. To ensure freshness of our product, orders placed between Wednesday after 12:00 noon and Sunday are baked and shipped Monday morning. It is our goal to insure you or your recipient receives a high-quality, fresh, and tasty product. Due to the perishable nature of our products, for orders being shipped to a destination whose delivery will take longer than 3 days to ship via standard shipping, we require FedEx 2nd Day or Overnight Shipping Service. Please call 901-866-2447 with any questions and for exact shipping information. Because our products are perishable food items and cannot be restocked once they leave our facility, we cannot be held responsible for orders that are delayed or not delivered because of an incorrect or insufficient address. Please make sure that the shipping address is absolutely correct before you submit the order. Shipping To Multiple Locations Customers have the option to either enter the list of addresses in the “Special Instructions” window at Checkout, or to e-mail us a list to ricki@rickiscookies.com. Whichever option you choose, please make sure that the information is clear and understandable. If you are concerned about our receipt of the information, please feel free to email us or call us at 901-866-2447. If you would like the shipment of your order to be delayed and sent on a future ship date, please type your request in the “Special Instructions” window, which will appear during the checkout process. Shipping charges are calculated based on the total weight of your order and is calculated in real time using our discounted FedEx rates. 2 Day Air and Overnight charges are estimates only. We will call or email you if the charges are different than what is quoted. Ricki’s Cookie Corner ships all of our packages via FedEx from our bakery in Memphis, Tennessee. We do not ship to Alaska and Hawaii, or outside of the 50 United States. All orders placed by 11:59 p.m. EST can be processed the following business day. Shipping dates are automatically calculated based on desired arrival date and recipient's shipping address. You may select future arrival dates on all orders. 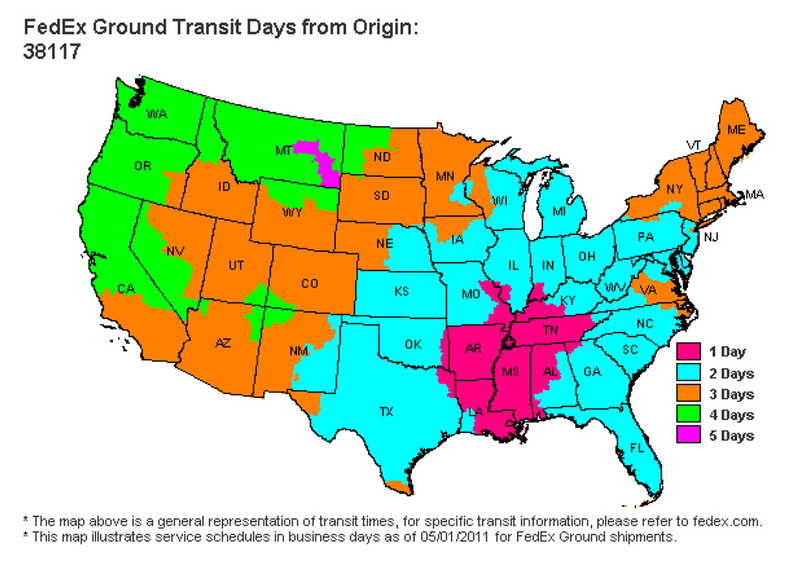 FedEx Ground shipping delivery dates are estimated based on the map below. All orders placed by 11:59 p.m. EST can be processed the following business day and delivered 2 business days from that date. • Orders placed on Monday can ship Tuesday to be delivered Thursday. All orders placed by 11:59 p.m. EST can be processed the following business day and delivered the next business day after that. • Orders placed on Monday can ship Tuesday to be delivered Wednesday. FedEx delivers M-F and does NOT consider Saturday or Sunday to be standard delivery days. As such, Saturday delivery is only available in certain areas and requires an additional shipping cost. Please contact Ricki’s Cookie Corner to find out more details! We cannot not ship to P.O boxes, APO's or FPO's as UPS requires a numerical street address for all deliveries. Please verify carefully your shipping address as we cannot be held responsible for mistyped or incomplete addresses. Make sure to include apartment or suite numbers if necessary.